Carrier frequency 0.5kHz~16kHz, auto adjust the carrier frequency according to the load characteristics. Overload ability Model G: 60 seconds for 150% of rating current and 3 seconds 180% of rating current. Model P: 60 seconds for 120% of rating current and 3 seconds 150% of rating current. Torque upgrade Auto torque upgrade; manual torque upgrade 0.1%~ 30.0%. V/ F separation Two methods: full separation and half separation. Acceleration/deceleration curve Linear or S curve acceleration and deceleration. Four kinds of acceleration and deceleration time, whose range is 0.0~ 6500.0s. DC brake Linear brake frequency: 0.00Hz~ maximum frequency, brake time: 0.0s~36.0s, brake current: 0.0%~ 100.0%. Jog control Jog frequency: 0.00Hz~50.00Hz, jog acceleration and deceleration time: 0.0s~6500.0s. Simple PLC, multi-step run 16-step run can be implemented by built-in PLC or control terminals. Built-in PID Conveniently implement the process to control the close-loop control system. Auto voltage regulation (AVR) When the voltage on the power network changes, it can automatically remain constant. Over-voltage/over-current control The current and the voltage is automatically limited during the operation to avoid frequent trip. Quick current limit The maximum limit reduces the over-current fault to protect the normal run of the frequency inverter. Torque limit and control Based on the “excavator” characteristic, the torque is automatically limited during the operation to avoid frequent trip; the close-loop vector mode can implement the torque control. Customized Function Outstanding performance Implement asynchronous motor control with high performance current vector control. Instantaneous non-stop Compensate for voltage drop by the energy fed by the load during instantaneous power failure to keep the frequency inverter running in short time. 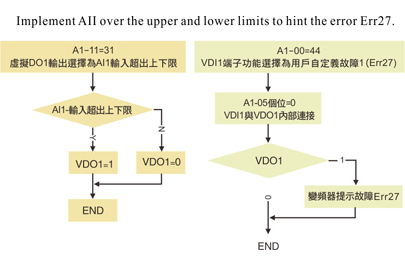 Quick current limit Avoid the frequent faults for the frequency inverter. Virtual IO Five sets of virtual DIDO can implement simple logic control. Timing control Timing control: set 0.0 ~ 6500.0 minutes. 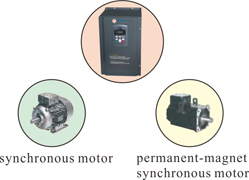 Multi-motor change Two sets of motor parameter can implement the change between two motors. Multiple protocols Four communication protocols: Modbus, Profibus- DP, CANlink, and CANopen. Over-temperature protection of motor Optional IO expansion card 1, where the simulation input AI3 can accept the input from the motor temperature sensor (PT100, PT1000). Multiple encoders Support the differential, open-collector, UVW, rotary transformer and sinusoidal encoders. Powerful backstage software Support the operation of the inverter parameter and virtual oscilloscope. With the virtual oscilloscope, the status in the frequency inverter can be graphically monitored. Command source Operation panel, control terminal, series communication port, and multiple changes. Frequency source Ten frequency sources: digit, simulation voltage, simulation current, pulse, series port, and multiple changes. Auxiliary frequency source Ten auxiliary frequency sources, which can flexibly fine-tune the auxiliary frequency and make the frequency synthesis. Five digital input terminals, where one of them can support 100kHz pulse input. Two simulation input terminals, where only one can support 0~ 10V input. One terminal supports 0~ 10V or 0~ 20mA input. 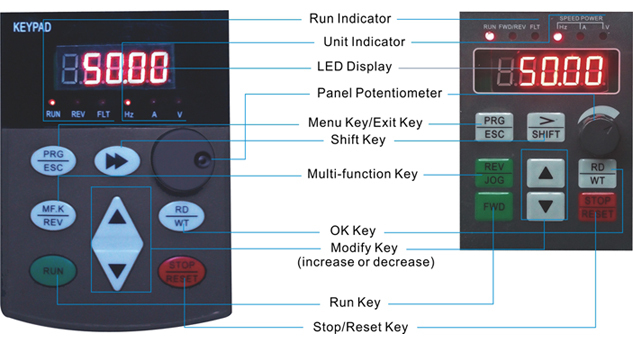 One simulation input terminal supports - 10V~10V input and PT100/ PT1000. One pulse output terminal (optional for open collector) supports 0~100kHz square signal output. One digit output terminal and one relay output terminal. 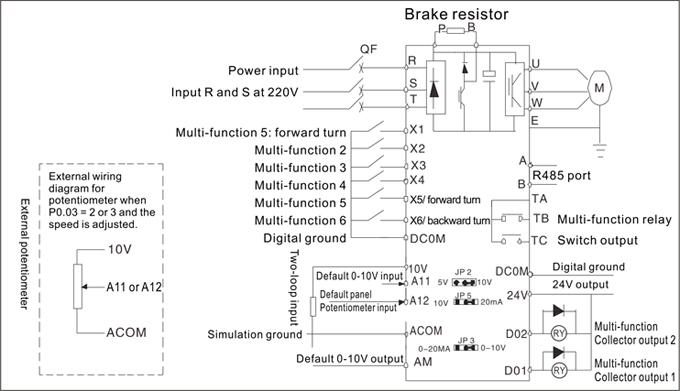 One simulation output terminal supports 0~20mA or 0~10V output. Display and Keyboard LED display Display the parameters. Parameter copy Quickly copy the parameters on the LCD. Key lock and function selection Implement the partial or full key lock, and define the partial operations to avoid misuse. Protection Short-circuit detection of motor, protection of phase reversal of input/output, over-current protection, over-voltage protection, phase reversal protection, over-temperature protection, and over-load protection. Location Indoor, without direct sunlight, no dust, corrosive gas, flammable gas, grease, vapor, drop or salt. Humidity Less than 95%RH without water condensation. 9600 series frequency inverters are the mainstream models. 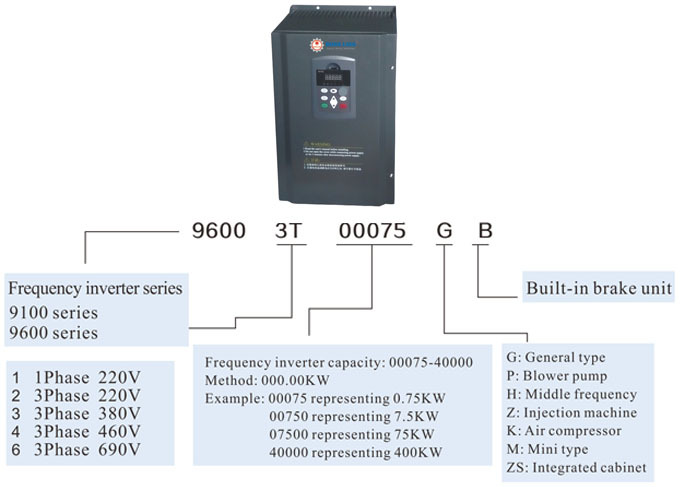 Based on the customer requirement, high quality and reliability, 9600 series frequency inverters with the excellent performance and the powerful function will bring you a new experience. Support the vector control for many motors. Support the vector control of 3P AC asynchronous motor. Support the vector control of 3P AC synchronous motor. Support the vector control of the permanent-magnet synchronous motor with absolute position feeding. 9600 series frequency inverter can provide 150% of start torque at 0.5Hz (vector control without sensor) and 180% of zero-speed torque at 0Hz (vector control with sensor). Differential encoder The torque response is < 20ms without the vector control of a sensor. The torque response is < 5ms with the vector control of a sensor. The vector control without speed sensor can block the motion, and output 150% of the rating torque at 0.5Hz; The vector control without speed sensor can lower the sensitivity of the motor parameters and enhance the site adaption; The winding control can be applied for the situations where many motors drag the same load. 9600 series frequency inverters can limit the torque. When the torque command exceeds the maximum torque that the motor can tolerate, the frequency inverters can limit the torque in the maximum setting torque to make the maximum efficiency and provide the more protection of the equipment. Five sets of virtual DIDO can be set. The status of the virtual DI terminal can be directly supplied by the function code or bonded by the corresponding virtual DO. This function means the frequency inverter will not stop when the power instantaneously fails. In the circumstances of instantaneous power failure or sudden voltage drop, the frequency inverter lowers the output speed. With the energy fed by the load and the reduction of compensation voltage, the frequency inverter can continuously run in short time. Each of simulation input (AI1~ AI3) can set a curve with four points individually. AI1 has the isolated input, which can be used for PT100, PT1000 or ±10V input. The I/O expansion card can be chosen. The simulation input AI3 can accept the input from the temperature sensor (PT100, PT1000). When the motor temperature exceeds the threshold, the impulse signals from the frequency inverter will hint over-temperature. When the motor temperature exceeds the over-temperature value, the frequency inverter will output the fault to give the protection to the motor. The quick current limit can prevent the frequency inverter from frequent over-current alarm. When the current exceeds the protection point, the quick current limit can quickly limit the current within the protection point to further protect the equipment and avoid the sudden load or over-current alarm. 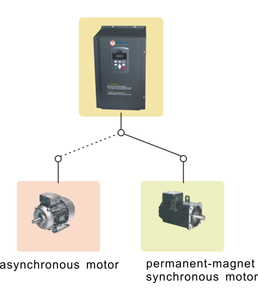 Four sets of motor parameter not only can implement four motor changes, but also achieve the change between the synchronous motor and the asynchronous motor. Don't directly connect the discharge resistor to the P or N terminal. 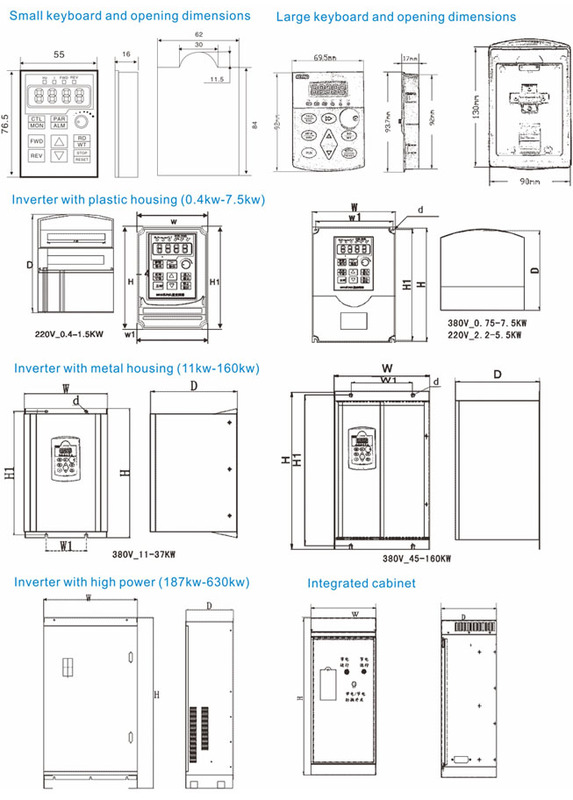 If the inverter terminal is P or N, the discharge block must be additionally installed. If the brake assembly over 93KW is connected to the P or N terminal, please remind us before ordering.